Serving the Greater Pacific Northwest and Rocky Mountain States. Specializing in the Repair, Maintenance, Overhauls and Installation of Steam Turbines providing premium technical services and skilled manpower to the Power Generation, Pulp and Paper and Petroleum Industries. Elliott, G.E., Dresser-Rand, Westinghouse Turbines and more. Consulting/Technical Supervision and or Turn-Key Contractor Services. PTS offers services that will improve your rotating equipment reliability & minimize your down time. Our Turn Key Manpower services include qualified Field Service Engineers, Journeyman Millwrights, Machinists and Certified Welders or we can work with your in-house personnel. Additionally we provide diagnostics, vibration analysis and inspections on Turbine Generators. individual parts as well as Joy Air Compressors, Woodward Governors, InPro Bearing Isolators, and more. 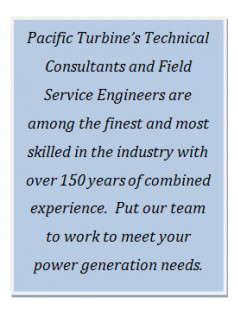 © 2011 Pacific Turbine Services LLC. All Rights Reserved.